New York boasts an impressive set of El Greco paintings, held at the Metropolitan Museum of Art, the Hispanic Society of America and the Frick Collection. This year, as the world marks the 400th anniversary of the visionary artist’s death, the Metropolitan Museum is at the centre of a major exhibition that seeks to reunite them. We asked the curator Walter Liedtke to tell us more. The exhibition commemorates the 400th anniversary of El Greco’s death by gathering together all his paintings in the public collections of New York City, insofar as is possible. The Metropolitan Museum has 10 pictures, but two of them are normally on view in the separate Robert Lehman Collection. Six paintings have been lent to the Met by The Hispanic Society of America. The three major paintings in The Frick Collection cannot be lent but will be moved to a single wall, about half a mile down Fifth Avenue. Despite its small size the exhibition reveals the full sweep of El Greco’s career, except for the few surviving works he did in his native Crete. The Met’s Christ Healing the Blind, represents a virtuoso assimilation of Veronese and Tintoretto, who with Titian and Bassano were El Greco’s touchstones in Venice during the late 1560s. A Pietá from the Hispanic Society and a full-length portrait in the Frick were painted in Rome (1570–76), and everything else in the show spans the painter’s many years in Toledo (1577–1614). I’ve been the Met’s curator of Dutch and Flemish paintings since 1980, but for several years I’ve studied our Spanish pictures as a serious hobby. At a certain age it’s rejuvenating to do something different. And all my colleagues in Spain are, for me, new faces! Despite the inclusion of the View of Toledo and the intense Portrait of Cardinal Niño de Guevara (which could frighten Francis Bacon), The Vision of Saint John remains the most extraordinary thing, as it was for artists ranging from Picasso as he painted Les Demoiselles d’Avignon to Jackson Pollock in a series of drawings after the apocalyptic scene. This show is fascinating as a reflection of sophisticated New York taste at a particular moment, about 1900–20. The enthusiasm of critics and of modern painters such as Cézanne, Picasso, Kokoschka and the German Expressionists inspired the Met itself and its great benefactors (such as the Impressionist collectors Henry and Louisine Havemeyer) to bring great works by El Greco to America shortly after his ‘rediscovery’ in Spain. A special case anywhere would be Archer Huntington, who founded the Hispanic Society in 1904 and was a serious scholar of Spanish culture. Scheduling our own exhibition in the same year that we have generously lent several El Grecos to the major exhibitions in Toledo and Madrid. However, this project cannot be compared as a challenge with the Met’s major El Greco exhibition in 2003–4 (which then went to the National Gallery, London). Perhaps the greatest effort was actually devoted to El Greco catalogue entries on the Met’s superb website. How are you using the gallery space? This was easy. We needed to move the El Grecos from our Spanish galleries to a larger North Italian space, a displacement El Greco would appreciate. In Rome he lived in the Palazzo Farnese until they showed him the door. Apparently his ego couldn’t fit in the building. The three El Grecos in the Frick, which can’t lend paintings acquired by Henry Clay Frick himself (he died in December 1919). If we changed the context from New York to America then we’d want the monumental Assumption of the Virgin, which was given to the Art Institute of Chicago in 1906. It was the central image in El Greco’s first great project in Spain, a huge retable and two side altarpieces (1577–79) in Santo Domingo El Antiguo, Toledo. 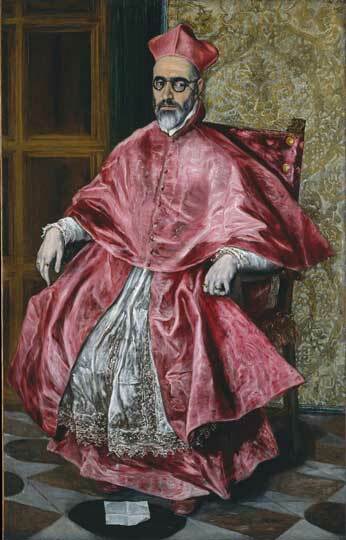 Nonetheless, ‘El Greco in New York’ is an experience second only to seeing all his works still in Toledo and Madrid. ‘El Greco in New York’ is at the Metropolitan Museum of Art, New York, from 4 November–1 February 2015.